The match started again after rain.target to win decided 71 runs in 6 over but DD can't achieve this target and only scored 60 runs. The result is RR won the match by 10 runs. 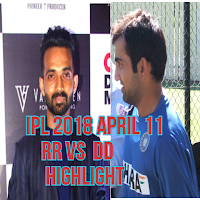 today's match is between RR and DD. as similar other previous ipl matches of sesson 11 in this match Gautam Gambhir the captain of DD won the toss and choose to feild first. Both teams have lost their previous matches so this match is too important for both teams. Sanju Samsun and Ajinkya Rahane increasing the team score very well. they hit boundaries and sixes also. At the end of 7th over the score of RRis reached to 58 for the loss of 2 wickets. Samson achieved RRs score to 77 in 9th over. After 10 over is at 84 for the loss of 2 wickets. Samson is still playing at 33 of 18 delivery and Rahane is at 29. RR lost his 3rd wicket of Sanju Samson in 12ve over. he scored 37 in 27 delivery. Buttler and Rahul Tripathi scored 18 runs in 17th over with the help of 2 sixes and a boundary. Mohammad Sami got the wicket of Jons Buttler in 18th over. Buttler 29 in 18 delivery. Unfortunately, slow rain started just before the last bowl of 18th over. RR at this moment is at 153/5.